Rebekah Garcia was born and raised in East Greenbush, New York. She had been working in the healthcare field for several years as an Albany Medical Center ED Patient Care Technician when she made the move over to Mohawk Ambulance Service as an EMT. In the three short years since joining our team, Rebekah has come to embody the core spirit of the job. Rebekah has time and again proven herself to be an asset. Rebekah challenged herself to complete her certificate of Paramedicine at Hudson Valley Community College. She now serves as Paramedic and as a well-respected Field Training Officer for our newer employees. Her exemplary work has earned her our Distinguished Service Award, which while prestigious is unremarkable in comparison to the multiple compliments and regards she receives from her patients. In addition to providing superior and compassionate healthcare for her own patients, Rebekah has indirectly impacted the lives of many others by being a leader and always setting a good example. She has proven to be an exceptional role model to her colleagues, and has become an invaluable member of our family. Rebekah has demonstrated that a combination of hard work, dedication, and resilience is an unstoppable force leading to a bright future. 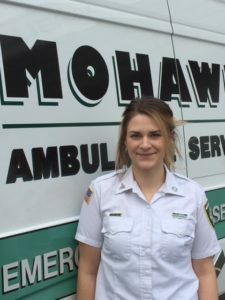 Mohawk Ambulance Service is proud to announce Paramedic Rebekah Garcia as a 2018 American Ambulance Association Star of Life.